The next morning when I woke up in the bus, I realized something. I was naked, my virginity gone, oh no.. Nope, just kidding. So the next morning when I was woke up in the bus, I realized that I've arrived at Rantepao, North Toraja. The helper of the bus driver announced some stop points while I didn't know where my stop was. I was just confused, I knew my stop must be Rantepao, but I didn't know if there were some stop points too in Rantepao. So, I tried to relax, and just get off from the bus at the last stop. Lucky me, the last stop turned out to be the nearest stop from my hotel. It was around 6 am when I get off from the bus, and then I saw a big landmark of Rantepao which is a Tongkongan in the middle of main road. 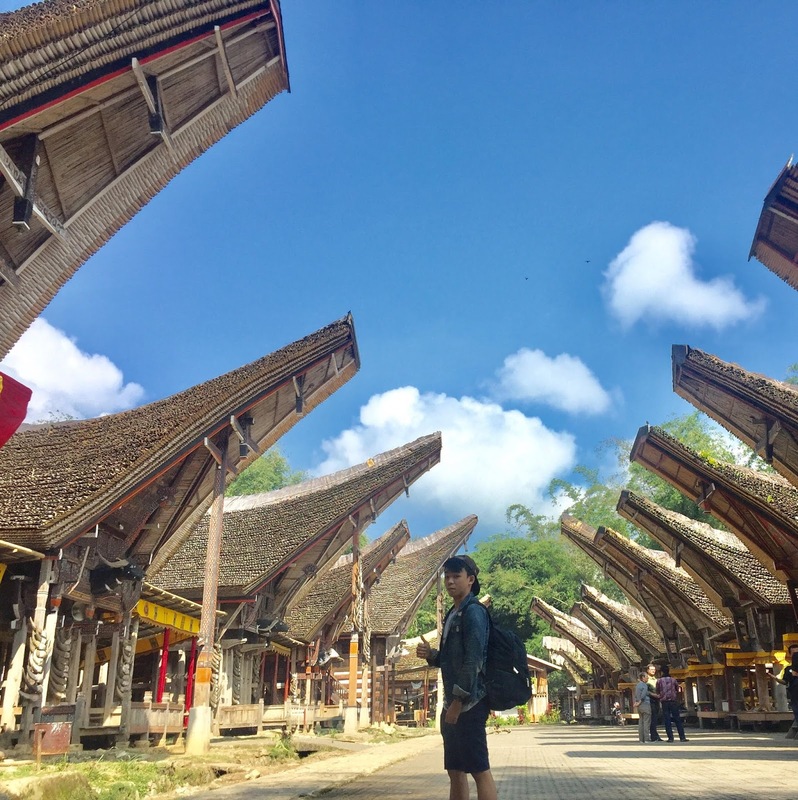 Tongkongan itself is a well known custom house of Toraja. I glad to be here, but I was a bit scared because it was just 6 am, meanwhile the check in time must be 2 pm, and I didn't know where to go. 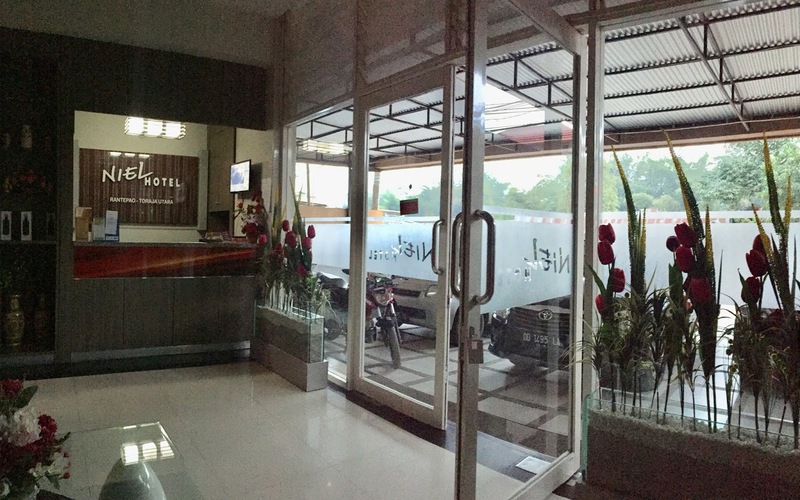 At the end, I decided to went to the hotel by sitor maybe chilling out at its lobby. Sitor itself is kind of motorcycle that mixed with becak. 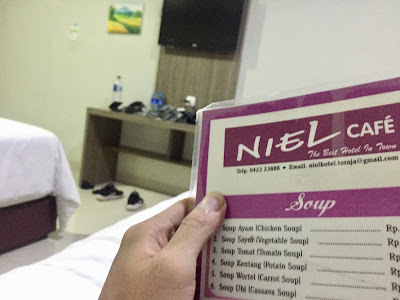 It's only 2.5 km away from my stop to my hotel, Niel Hotel Toraja. According to my first impression, this hotel was nice. I was just sitting at the lobby, had a talk with receptionist, and then.. I was asking if there's a tour package from this hotel or not. The receptionist told me if there was no tour package from the hotel, but she could introduce me a tour guide and the rental car. It took IDR450k for the rental, and IDR550k with the tour guide. I was just confused. I got my itinerary on me, but I was just confused. I mean, it could be exciting to explore my itinerary by public transport. But soon after I cross checked, It was a.. pretty complex distance from my destination to other destinations. Besdie that.. if I got the tour guide on me, he could be my photographer as well, right? So, why not? 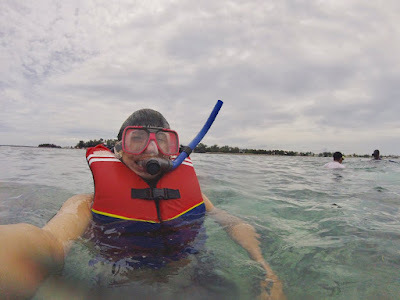 And then, I just had talked on phone with the tour guide, and.. IDR550k. After that, I went to the hotel canteen, had a breakfast, also my first coffee in Toraja there. Ah, what a morning. Stranded at a completely extraneous place, alone, 1.932 km away from my hometown, for the first time. Cool. It was around 9 am when the tour guide came to the hotel, met me, informally acquainted, and then talked about prices again. My tour guide seemed friendly, a man with a long hair, maybe he's around 30, and tattooed. We got into the car after that, and I said to him if I want to go to Kete Kesu and the statue of Jesus. Both places are located far apart, and then up to him. Kete Kesu is a village destination with a beautiful panorama of Tongkongan, also with Torajanese traditional funeral behind it. So, the Torajanese are really well known by their funeral tradition which is very unique and culturally strong. Meanwhile, the statue of Jesus in Toraja is one of the highest Jesus Statues in the world, made of bronze, and 40m tall. It's taller than Christ the Redeemer, statue of Jesus in Rio De Janeiro, Brazil. Well Kete Kesu located just around 2 km away from my hotel while the statue of Jesus is like.. ± 20km away. 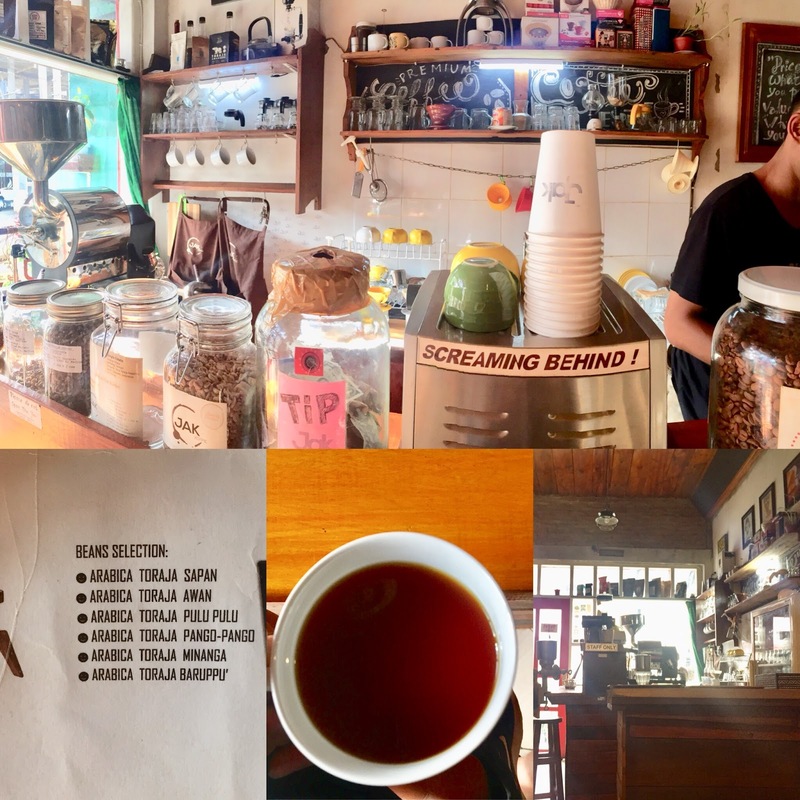 My complete itinerary for my first day in Toraja would be like: Kete Kesu first, then Lemo/Londa, Batutumonga, Jesus Statue, went to paddy fields, up to the mountain, then.. ended up at the coffee shop at around 5 pm. My tour guide explained me many things about the history of Tongkongan, the terms to build Tongkongan, and also became my photographer as well. So, there are some terms to be completed if we want to build Tongkongan, like: there must be bamboo forest near there, and I forgot the rest. But Tongkongan is cool. Moving on from Tongkongan, I went to the funeral places inside the Kete Kesu. There are some interesting things at the funeral place such as.. some dolls that inspired by corpses, bones and skulls at the cliffs and caves. Kete Kesu was fun for me. I was searching on internet about it back then, and when I arrived there I was just grateful that I can explore this place. Well, went to Kete Kesu at very first was a nice introduction from Toraja to me. After exploring Kete Kesu, I went to another Torajanese funeral place named Londa/Lemo. Londa and Lemo are burial caves that located at the cliffs. My tour guide told me that Londa and Lemo are like the family burial place. I was very amazed when he told me that a few days ago there was buried person on the cliffs. So, there were many people hoist the body onto the cliffs. That's insane, and cool, at the same time. Wow. I'm so grateful that I've explored the famous Torajanese funeral places. What a tradition, what a culture, what a history. Cool. After exploring Funeral places, then I went to the west of Toraja to met Jesus, in statue. It's kind of the landmark of pride for Torajanese since the majority of Torajanese are Christian. Actually, there is another Jesus Statue in Sulawesi which located in Manado. The trip to statue of Jesus in Toraja was quite uphill. The statue of Jesus is located at Buntu Burake Village, I went there around 12am and it was so... hot. Hot damn, hot damn, hot damn uptown funkyouup. But the sceneries around were so.. beautiful. Really. Beautiful. With the meandered uphill road. The height of Jesus Statue in Toraja is 40 m meanwhile the height of Jesus statue in Rio De Janeiro is 38 m. The main differences between both statues are their hands: Toraja's Jesus upward, meanwhile Brazil's Jesus like.. straight. I loved the sceneries around Buntu Burake. We can see Rantepao from the height. Lucky me, it was a weekday so it wasn't too crowded there. Well, it was the first Landmark of Jesus Statue for me. Maybe next time I could see another landmark of Jesus statue in different destination. Maybe Manado.. or, Brazil. From Buntu Burake, I continued my journey to.. my tour guide. I didn't know where to go, so my tour guide was taking me to enjoy the view of the rice fields, and up to the mountain. By the way, this trip should be around Rantepao (North Toraja) and Makale (capital city of Tanatoraja), so my other destinations which were pretty far such as Ollon and 'Negri Diatas Awan' carried out the next day. My tour guide was really friendly and insightful. I really liked to had a discussion with him. We talked a lot about politic, football, and other 'serious' issues. The most interesting discussion for me was when he said that he's an ex-Fr**port worker. So when I was in the third semester, one of Fr**port representatives came to the guest lecture and echoed some 'good things' and 'media slander' about Fr**port. But soon after I heard some facts from the ex-worker, I felt like "Fr**port just too.. dangerous". I want to say horrible actually, but let's just say it 'dangerous'. I'm not really into the culinary when I travel, but I was trying some local food in Toraja. I tried 'bamboo chicken' on that day. It was a kampong chicken placed in bamboo. I don't think I like that dishes, really. But I really enjoyed the view around the restaurant. After ate the bamboo, I mean chicken, I went to the mountain. Besides tour guider, discussion friend and photographer, my tour guide was a good driver too. He really was. It was 4 pm when we drove down the mountain. My tour guide was recommending me his friend coffee shop. And as the coffee lover, it wasn't hard for me to say "LET'S GOOOOO btch". I mean, just let's go, without btch. 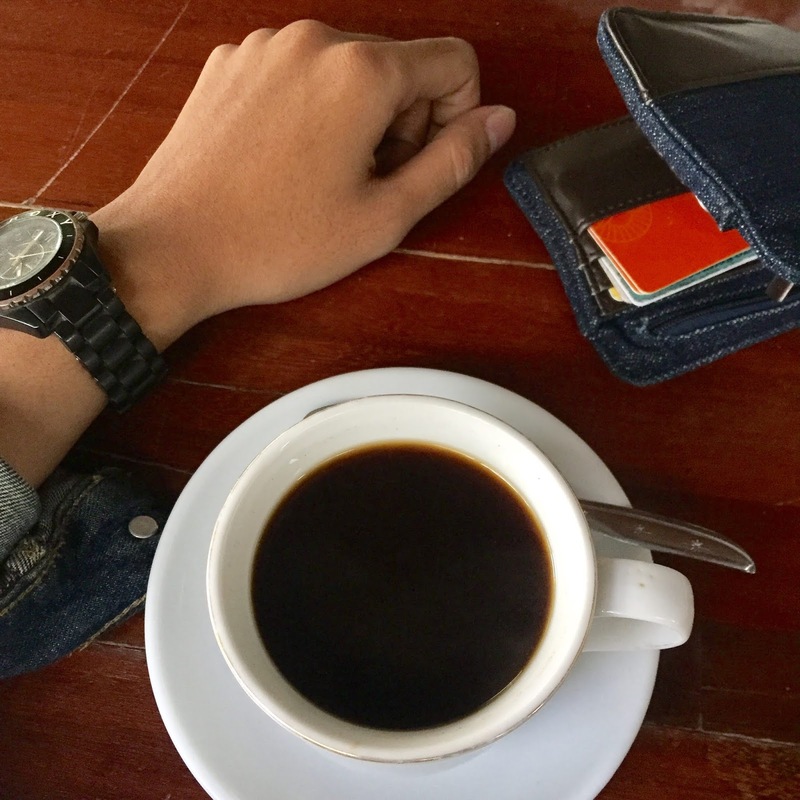 And that's how I met Jak Koffie for the very first time. We arrived at the small red color door coffee shop. Althought it's small, but the place was comfortable. It felt like this coffee shop got his 'soul'. I was just feel so comfortable with all the coffee ornaments, really. I felt like this place is really really me. My tour guide introduced me the owner of this coffee shop. He was the barista too here, and very insightful too. He said he got a friend who open the coffee business near my campus. Cool. I was randomly ordering a cup of coffee named 'Arabica Toraja Awan'. I just found out if the real coffee colored like tea and the aroma too. The interesting part is when I drank this Toraja Awan, and then I drank a cold water, the falvor of the coffee transformed into a sweet taste. Wow. Awan itself is refers to the place where the coffee beans were picked, so does other menus such as Sapan, Pulu-pulu, etc. They refer to to the place where they were picked. I arrived at the hotel around 6.30 pm and glad enough that finally I can checked in. Before I went to my room, I was make another deal with my tour guide. I said to him that I want to go to Ollon tomorrow. Then we agreed on the price, he'll picked me up at 7 am. Ollon itself is a very beautiful hill which many people called it the hidden treasure of Toraja. It takes a lot of stuggles to go there because the bad infratructure and road. Ollon is a place where you can take a photo, and if you posted in on your instagram and you set the location as 'New Zealand', everybody would believe. But it takes a lot of struggles.... really. Hahahahahahahahahahahaha. I'm laughing for real. You made my day---night, lol. Wait, I'll read again from the first paragraph. So, there are some terms to be completed if we want to build Tongkong, like: there must be bamboo forest near there, and I forgot he rest. <---I'm laughing out of load :) what the yuck. Because it's not just the Freeport itself. But the Indonesian 'rats'. thank you for your humble comment, Zahrah, wehehehe. Yes, I was censoring it, because I'm afraid of diciduk 'that' corporation. But since you've made it clear, well, thank you. When I read the title "SOLO", I thought you're going to... Solo.. Java. Hahaa. 'Cause I was just read another blog that she tells about her being to Manahan Solo. Hmm. But, then It's TORAJA! WOW! You go to Toraja aloneeeee... Wowowowow. "Wasn't 'gembel' enough to be a real backpacker" was a kampret word ever. Lol. You have a double bed but you're alone there. Wahahaa. If I were you, I would never be in a good sleep._. That's pretty implusive to thought it was Solo, hahaha. I realized if it was double bed after I checked in to my room. It wasn't that bad, at least I used the 2nd bed for my backpack. And at least I was pretty sure if there wasn no ghost following me and sleep next to me.